It is the season of winter depression. The temperature has changed, it is darker, and the sun doesn’t stay up as long. These changes can spark seasonal depression, and some people experience the affects of winter depression more than others. The change to fall and winter is an exciting time of year for some. However, for others it can bring about sadness, worry, discomfort, and anxiety. 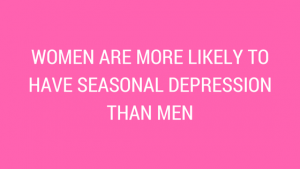 If your mood changes with the season, you may have seasonal depression. Is Your Winter Depression SAD? Women are more likely to have SAD than men. 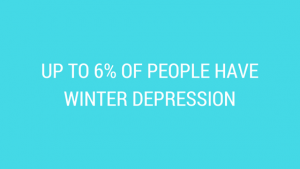 Four to six percent of people have winter depression. Do you have SAD? It is tough to say, since the holidays can trigger a variety of emotional and physical issues. 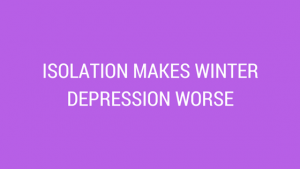 However, if you think you may have winter or seasonal depression, like SAD, you should talk to a doctor. If you are tired of being tired from seasonal depression, our specialists compiled a list to help ease those winter blues. One way to battle winter depression is to keep things simple, ensuring all your basic needs are met. These basic needs include proper amount of sleep, healthy nutrition, staying hydrated, and staying active through exercise. Interestingly, all of these basic needs will support overall health and wellness. As fall becomes winter, it is important to stay active socially. Many people will turn inward and isolate themselves during seasonal changes. However, it is vital to your health and wellness to get out, stay active, and be in the company of people you care deeply about. To many people’s surprise, SAD is common. You may find that you are not the only one experiencing SAD, winter depression symptoms. Talking about it with close friends and family can be insightful, and help you get your feelings out in the open. You most certainly don’t need to deal with seasonal depression on your own. If the winter blues are controlling your daily life, it is time to take action. You can use any of the above ways to help battle Seasonal Affective Disorder (SAD). It is also important to talk to a doctor about how you feel as well. Our free Dr. Chat makes online doctor medical advice accessible 24/7. Dispel the myths of depression. Simply click the button below to talk with a doctor about SAD, winter depression, or any other health and wellness concern you may have today!